All the fun of working at a supermarket, minus the minimum wage and weird smells. 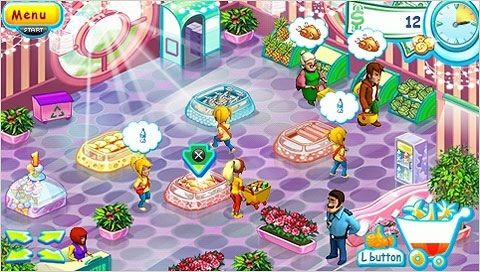 Supermarket Mania (PSP Mini, $4.99) casts you as an attractive blonde woman named Nikki who must maintain order in different supermarkets by repeatedly stocking shelves to satisfy customers, pick up garbage and thwart thieves, all in the hopes of earning cash and sticking it to her former employer, the evil TORG Corp. It plays similar to Cake Mania and Diner Dash, as you direct Nikki around the playfield, budgeting her time and accomplishing different tasks to keep people happy. While it offers nothing new to the genre and the controls are a bit tricky, it's a fun way to pass the time. As customers enter a store, you guide Nikki to various kiosks and fill them with food, be it pineapples, fish, apples and turkey, among other items. A patron's desired food always appears over his or her head, and each one has a distinct personality/shopping style (impatient, slow, etc.). You only have so much food in Nikki's shopping cart to dispense (you'll need to replenish it a few times per round), but as long as you pay attention to the finer details, it's tough making mistakes. Keeping up with customer demands, however, is a whole other issue. It's easy to bring a tired old lady some fish, but things get crazy when you have multiple customers in the store at once; take too long to restock a kiosk, and the person leaves. To make matters worse, garbage occasionally appears on the floor and customers can trip over it, so it's in your best interest to clean that stuff ASAP. For the most part, Supermarket Mania's enjoyable. The colorful and detailed graphics make it easy to see what goes where, and there's a great sense of accomplishment from completing a particularly tough level. That said, we dislike the controls, but only because we're so used to the DS and iPhone's touch screens. To compensate on the PSP, developer G5 Entertainment forces you to use the d-pad to cycle through different kiosks. While not a bad idea, there are so many kiosks that it's easy to get stuck on the back row when you need to maneuver Nikki to the front of the store. That's a huge flaw for a game that makes timing so important. Fortunately, you can purchase different upgrades to give her an edge, such as coffee (makes her run faster) and chewing gum (entices customers to spend more at the checkout counter). In addition, and for whatever reason, it's difficult reading text. G5 tells the story through comic book style panels, and the text is much too small. Then again, there's little reason to pay attention to the narrative, since it's mindless fluff. 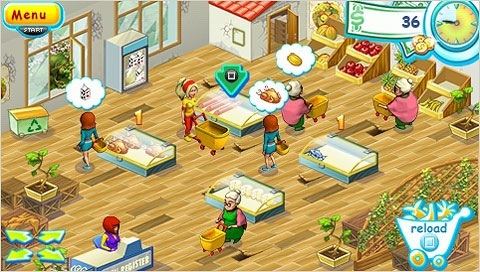 If you grew tired of time management games, Supermarket Mania won't thrill you, as it's basically the same thing as Diner Dash, but it's a well-made clone that won't take up too much PSP memory at 36MB. While it costs two dollars more than it's probably worth, 50 levels will keep you stocking shelves for a little while. What's Hot: Fifty levels, 22 accessories and upgrades, attractive cartoon style graphics, Diner Dash style gameplay. What's Not: Tricky d-pad controls.